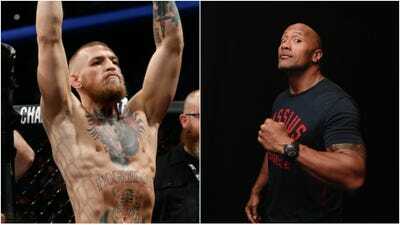 Getty ImagesConor McGregor (left) and Dwayne ‘The Rock’ Johnson (right) have been gushing over each other on Instagram. The Rock and Conor McGregor have been gushing over each other on Instagram. Hollywood actor and former WWE star The Rock watched “Conor McGregor: Notorious” – a documentary that detailed McGregor’s rise to the top of the mixed martial arts world. The Rock told his 106 million followers that the movie is a knockout success. It did not take long for McGregor to notice the review, and the Irishman called The Rock his “uce” – Samoan slang for brother. Dwayne “The Rock” Johnson and Conor McGregor have been gushing over each other on Instagram. Johnson, renowned for roles in hit movies like “Moana” and “Jumanji: Welcome to the Jungle,” watched “Conor McGregor: Notorious” – the documentary that detailed the Irishman’s extraordinary rise to the top of the combat sports world. The filmmakers behind “Notorious” followed McGregor over the course of four years – from the fighter’s humble beginnings claiming benefits in Ireland, to his unprecedented success in mixed martial arts where he became a two-weight world champion in UFC. Saturday night doc viewing. @thenotoriousmma NOTORIOUS. Great insight into the DNA of this successful and smart business man. Best part of his success, is when you strip it all away – it will always come down to being the hardest worker in the room. Those roots never go away. Solid doc. Well done brother. ???????? It did not take long for McGregor to notice the feedback. McGregor signed off by saying “big respect my Uce,” which is Samoan slang for brother. McGregor took a hiatus from UFC so he could challenge Floyd Mayweather to a boxing rules contest in 2017 – a bout he lost in the 10th round. He was due to return to a UFC octagon this year but talk of a comeback bout has been postponed as McGregor is due to appear in a New York City court on June 14. He faces assault and mischief charges for allegedly throwing a metal trolley through the window of a bus carrying UFC athletes and employees.